Where can a teacher easily find interesting pieces to share in the classroom? 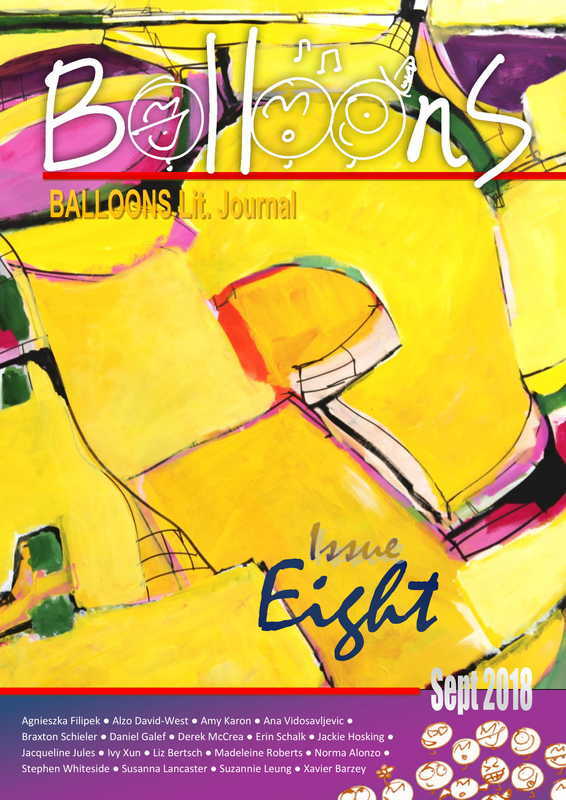 Look no further than Issue 8 of Balloons Lit. Journal. This magazine for upper elementary and middle school students is an amazing resource of poetry, fiction, and art. What’s more, it includes contributions from all over the world and features student work alongside professional adults. 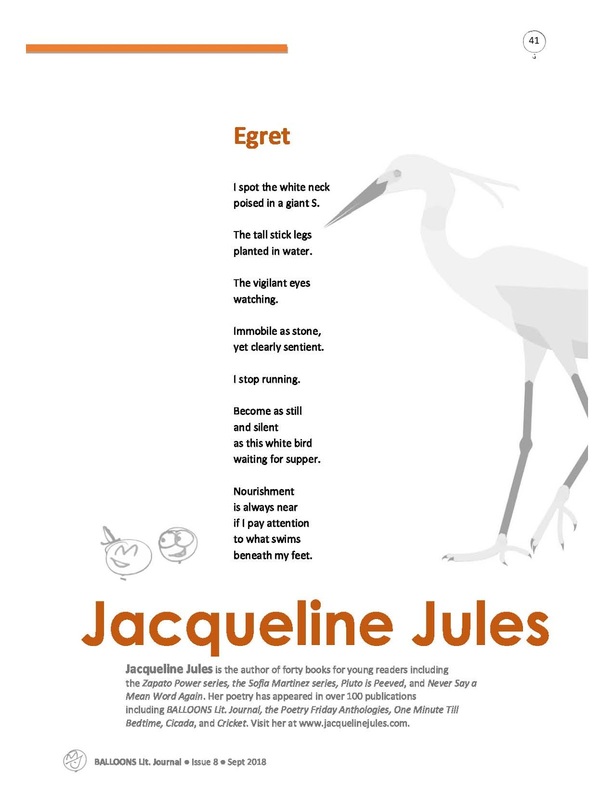 Poems are attractively presented in full page layouts sure to inspire the imagination. 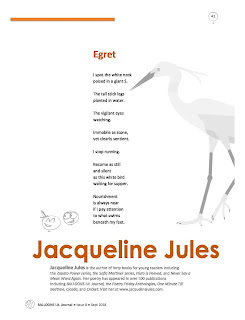 I am thrilled that one of my poems, “Egret” appears on page 41. I wrote “Egret” while I was out on a brisk walk near a body of water and this beautifully immobile creature stopped me in my tracks. Ask your students to describe an animal or plant so enchanting they couldn’t help but pause for a moment to gaze. Better yet, take your students outside and ask them to stand silently for five minutes, watching the natural world. What did they see, hear, smell? How did they feel? Can they make an effort to pay attention to the grass, the trees, the clouds, the insects, and everything else which flutters unnoticed when we hurry too much? Mindfulness can enrich one’s life as well as one’s writing. Listening to an author read their own work can be a meaningful experience for students. Balloons Lit. Journal also offers audio clips on selected pieces. Scroll down the page where Issue 8 appears and you will see an audio section and an opportunity to hear me read my poem, “Egret” as well as three other poets in this issue. I highly recommend sharing 14 year old Braxton Schieler’s voice reading his work, “Someday I’ll Be—An Autobiography.” Braxton writes about his life from the age of three till an imagined old age, describing emotional transitions with clarity and insight. Hearing a student read his own personal narrative aloud should jump start many a reluctant pen in your classroom. Other pieces in Balloons Lit. Issue 8, such as the poems, “I Think My Teacher is a Witch” and “Pillow Problems” could be great models for humorous writing. Finally the artwork in Balloons Lit. Issue 8 is stunning. Available in PDF form on the website, images could be projected to present the ekphrastic challenge of providing a written response to and/or description of artwork. Don’t miss this amazing resource for the classroom! 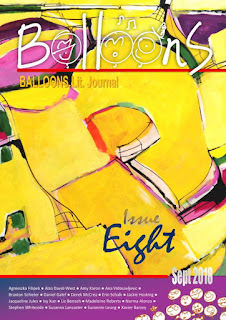 Check out Issue 8 of Balloons Lit. Journal today! Copyright 2010 Pencil Tips Writing Workshop. Powered by Blogger.